It is time once again for Top Ten Tuesday! Brought to you by The Broke and the Bookish, this week’s theme is Top Ten Books from X genre you have recently added to your TBR. After a quick browse of my TBR on Goodreads, it was obvious I had to go with fantasy/historical fantasy novels. This surprised me a bit as a few years ago I would been hesitant to pick up a fantasy novel but that seems to be the majority of what I read now. As time has passed my reading preferences have changed and that’s fine. As you grow and change as a person you can expect your likes and dislikes to change and I’m okay with that. The Dark Days Club (Lady Helen #1) by Alison Goodman – London, April 1812. On the eve of eighteen-year-old Lady Helen Wrexhall’s presentation to the queen, one of her family’s housemaids disappears-and Helen is drawn into the shadows of Regency London. There, she meets Lord Carlston, one of the few who can stop the perpetrators: a cabal of demons infiltrating every level of society. Dare she ask for his help, when his reputation is almost as black as his lingering eyes? And will her intelligence and headstrong curiosity wind up leading them into a death trap? Menagerie (Menagerie #1) by Rachel Vincent – When Delilah Marlow visits a famous traveling carnival, Metzger’s Menagerie, she is an ordinary woman in a not-quite-ordinary world. But under the macabre circus black-top, she discovers a fierce, sharp-clawed creature lurking just beneath her human veneer. Captured and put on exhibition, Delilah in her black swan burlesque costume is stripped of her worldly possessions, including her own name, as she’s forced to “perform” in town after town. Odd & True by Cat Winters – Trudchen grew up hearing Odette’s stories of their monster-slaying mother and a magician’s curse. But now that Tru’s older, she’s starting to wonder if her older sister’s tales were just comforting lies, especially because there’s nothing fantastic about her own life—permanently disabled and in constant pain from childhood polio. Cruel Beauty (Cruel Beauty Universe #1) by Rosamund Hodge – Since birth, Nyx has been betrothed to the evil ruler of her kingdom-all because of a foolish bargain struck by her father. And since birth, she has been in training to kill him. Red Sister (Book of the Ancestor #1) by Mark Lawrence – I was born for killing – the gods made me to ruin. Wild Beauty by Anna-Marie McLemore – Love grows such strange things. The Changeling’s Journey by Christine Spoors – Ailsa is dead. Leaving Morven the last surviving changeling in the village. Everyone knows it is only a matter of time before she too is dead. Desperate to find out why the fairies steal human babies, and to save her own life, she leaves her family behind, travelling north into the fairy kingdoms with her best friend. The Afterlife of Holly Chase by Cynthia Hand – On Christmas Eve five years ago, Holly was visited by three ghosts who showed her how selfish and spoiled she’d become. They tried to convince her to mend her ways. The Library at Mount Char by Scott Hawkins – A missing God. I think a couple of these may get the axe from my TBR list but for the most part they still sound interesting. I think Cruel Beauty, Wild Beauty, and The Library at Mount Char catch my attention most from the list. What books are on your TBR? 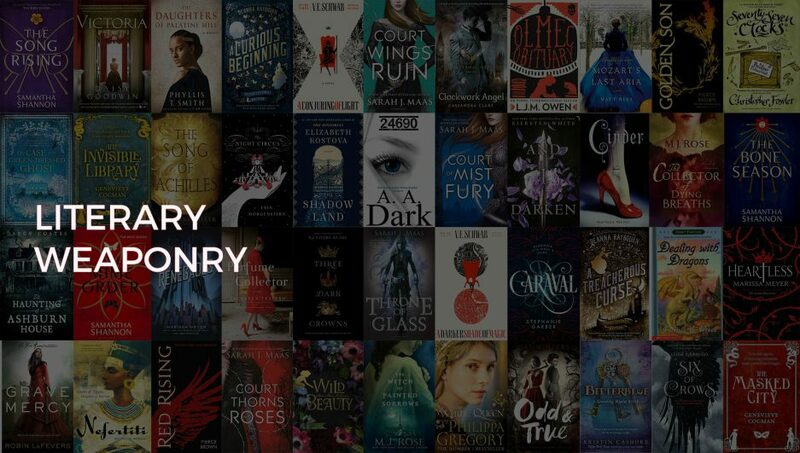 I totally need to read The Library at Mont Char, Odd & True, and The Afterlife of Holly Chase! The Library at Mount Char sounds really interesting, and I LOVE the cover of Wild Beauty ❤ This list makes me want to read a fantasy novel ASAP! Cruel Beauty has been on my TBR for a while now! Can’t believe I haven’d read it yet! A ton of great books on this list. I am so excited for Wild Beauty! You are welcome! When I see a cover or title that sparks my interest I want to know more about it immediately, not have to go searching so it seemed like the right thing to do. Wild Beauty’s been capturing my eye lately. I love seeing it on your list. A few of these are on my TBR, but you’ve brought some new to me ones to my attention so thanks for that! I’ve got so many of these on my TBR as well: The Dark Days Club, Menagerie, The Last Magician, Cruel Beauty, Odd & True, Wild Beauty, and The Library at Mount Char! That’s a lot, we definitely seem to have similar tastes! You’re one of the few people I’ve seen with Odd & True on their TBRs, I think it sounds so interesting and I really love Cat Winters! I also hadn’t heard of The Afterlife of Holly Chase before now either but I’m going to have to go add it now! I don’t know why but when I saw the cover I immediately thought of The Night Circus!